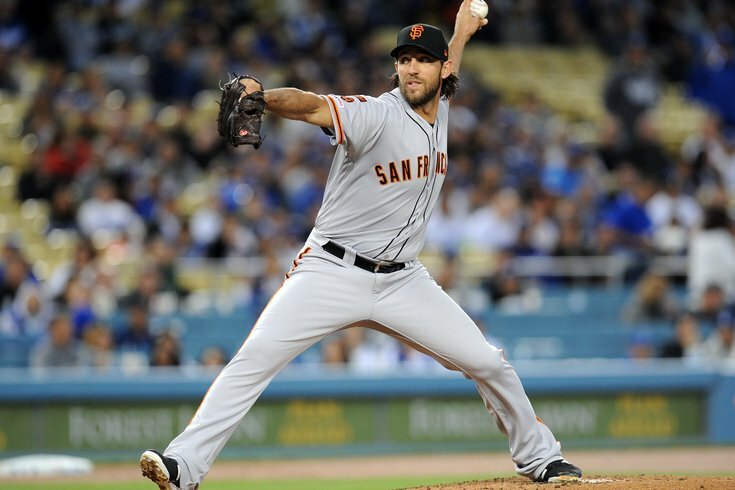 Madison Bumgarner is in the final year of his current contract with the Giants. When Nick Pivetta surrendered three straight hits and then a walk to lead off the first inning Wednesday night — increasing his already inflated ERA (which reached 8.78 by the end of the night) — Phillies fans could be forgiven for presuming the worst. Two fifths of their starting rotation, Pivetta and Vince Velasquez (who had a solid first start back on Monday) is pretty openly in flux. The team, of course, hopes this duo can right the ship and hold down the final two starting spots. But there have to be some contingency plans in place. After all, the offense has already shown it can be among baseball's best. Imagine the backlash if the organization squanders the season due to lack of pitching depth? Pivetta went on to allow three three runs in that top inning, one more on a sac fly, and another on an infield single. The hurler found his footing briefly as he tossed two scoreless frames, but he gave up three more runs in the fourth putting the Phils in a 6-0 hole. In all, Pivetta allowed seven hits while walking three in 3.2 innings. Philly already has issues in the bullpen, but it's minimized the damage thus far by having their starters go deeper into games than nearly any other team. And, of course, the offense too. The Phillies don't have the deepest pool of minor league starting talent — but they have some options, including the top prospect in the entire organization. That would be Adonis Medina, who is currently in Double-A but is also a member of the 40 man roster (meaning he is eligible to be called up if needed). Medina pitched five innings allowing one run in his first start for Reading. He'd be a stretch to fill in this soon, as he is just 22. Enyel De Los Santos pitched in the bigs last year, has one quality start under his belt for Lehigh Valley so far, and may be the leader to get the call if the team needs a change. Jerad Eickhoff is another name Phillies fans will remember from the last few seasons. He too is in Triple-A and on that top tier of pitchers who have proven they can come up and make a spot start in the majors. Drew Anderson is also on the 40-man roster and in Triple-A. He had a fantastic spring, nearly making the big league roster. He had a rough start to his year in Allentown. Ranger Suarez, the lone lefty starter on all of Philadelphia's 40-man roster is the club's seventh-ranked prospect overall. At 23 years old, he won his first start in Triple-A and many project he has a high ceiling. The Phillies hope whenever they make the call for Suarez, he comes up to stay. We wrote about this last week but the need has never been greater for one-time Cy Young-winner Dallas Keuchel. He reportedly has lowered his asking price and has been throwing full bullpen sessions to get ready to sign somewhere. The latest round of rumors has the Yankees eyeing Keuchel, perhaps to replace injured ace Luis Severino. This in addition to several NL East clubs kicking the tires on the hurler, including the Mets. It's worth adding that the Phillies already lost a draft pick this offseason when they signed Bryce Harper. If they wait until after the draft in June they won't be forced to lose another one (which could perhaps be a factor). At 31, Keuchel is still presumably in the latter half of his prime and worth paying — but the team wants to maintain some payroll flexibility. If they sign Keuchel, they will likely either exceed or come close to exceeding the luxury tax threshold. The Phillies have never in their history exceeded the luxury tax — but the likely have the money to do so. It is unknown if that's a possibility as this team continues to improve and contend. The Phillies have all of those young arms in the high minors, as we mentioned, plus an equally impressive group of position playing prospects. With a great deal of them blocked position-wise by franchise staples currently on the MLB roster, Philly has all the ammo it needs to go after a big fish at the trade deadline. During the heyday of the 2007-2011 Phillies, the team made a splash each and every year in late July. That seems to be a likely scenario for this new era. A few very, very early names that could be on the block — as they reach the end of their contracts or as they play on rebuilding teams include San Francisco's Madison Bumgarner, New York's Zach Wheeler, Arizona's Robbie Ray and Toronto's Marcus Stroman and Aaron Sanchez. Several of those names sound even better than Keuchel, which will make the Phillies think long and hard about when and if to make a move over the next few months.